California in the 1960s was the epicenter for spiritual experimentation. Indian gurus and New Age prophets, Jesus freaks and Scientologists all found followings in the Golden State. But among those looking for personal and social transformation, the unlikeliest seekers may have been a small community of Roman Catholic religious: the Immaculate Heart Sisters. Theirs was, as I discovered in my research on the order, a compelling spiritual saga, culminating in a showdown with the Catholic hierarchy. The story of that conflict spotlights the impact of the California dream on a Church in transition. Who were the Immaculate Heart Sisters? The Daughters of the Immaculate Heart of Mary was founded in Spain in 1848. Twenty-three years later, at the invitation of the bishop of California, 10 sisters came to the United States. Initially, the nuns worked with the poor, but pivoted later to education. In 1886 they began teaching in Los Angeles. Over the next several decades, they staffed Catholic schools, started a convent, and founded a high school and a college. The college, though, closed in 1981 due to financial problems. Among the high school’s most famous graduates is Meghan Markle, the fiancee of Prince Harry. In 1924, the order separated from Spain. The women renamed themselves the California Institute of the Sisters of the Most Holy and Immaculate Heart of the Blessed Virgin Mary. The “new” order flourished: By the 1960s, it had 600 members, most of whom were teachers. And by 1967 almost 200 sisters worked in Los Angeles’ Catholic schools. More served in their own order’s educational institutions. Led by broad-minded mother superiors, their order and their college were intellectually rigorous and open to diverse perspectives. They welcomed female speakers such as social activist Dorothy Day to campus as well as Protestant, Jewish and even Hindu religious leaders. Catholic leaders reviewed everything from interreligious dialogue to the role of the Church in the modern world. They even updated the traditional liturgy. The language changed from Latin to the vernacular, priests faced the people and popular music was welcomed into Mass. The debate over Vatican II’s achievements continues today. At the time, many Catholics were excited by the innovations, but others preferred the Church as it was. They were not eager to see the council’s intentions put into practice. James Francis Cardinal Mcintyre, Archbishop of Los Angeles, U.S., left. Among these conservatives was James Francis Cardinal McIntyre of Los Angeles. Following the recommendations of the Second Vatican Council, the Immaculate Heart Sisters decided to review and renew their religious life. In 1963, the sisters began a multi-year study of their spiritual practice, community structure and mission. They met regularly to talk and pray about the future of their order. According to Anita Caspary, the order’s head at the time, the nuns were inspired by the Second Vatican Council; the spirit of the times (that is, the 1960s); and the growth of diverse populations that were roiling Southern California. Many of the council’s directives did indeed reflect cultural shifts, such as reaching out to the modern, secular world, that had inspired the sisters. But the women also were inspired by trends closer to home. For example, Caspary and her community were intrigued by humanistic psychology, the psychological school that emphasized personal growth and fulfillment and which had a significant West Coast following. Until the 1960s, the women had followed Church rules that governed their religious as well as personal lives. Now, rather than assume that they all needed to pray, study or meditate in the same way or at the same time, they encouraged individual experimentation. When they did worship together, they wanted the freedom to decide when, where and how to do so. Likewise, the sisters sought relief from Church mandates that controlled their daily activities, ranging from what they wore and what time they went to bed to which books they were allowed to read. Sisters of the Immaculate Heart College preparing for a spring festival. Image courtesy of the Corita Art Center, Immaculate Heart Community, Los Angeles. On October 14, 1967, the sisters celebrated what they called Promulgation Day, the announcement of plans for their order’s renewal. A new vision for their lives and their work, the document, for example, said that sisters who taught in religious schools would be allowed to pursue teaching credentials and graduate degrees to professionalize their work. Those who did not feel the call to teach could find other careers. Additionally, each sister could choose the length, time and type of her individual prayer, and group prayer would be shaped by the community. They no longer had to seek permission from the mother superior for the small decisions of daily life. They would be free to set their bedtimes, see a doctor or make a quick trip to the store. Two days later, on Oct. 16, a delegation of six sisters sat in the office of Los Angeles’ Cardinal McIntyre. Furious with the sisters’ plans for renewal, he first asked about about their dress: Did they indeed intend to wear street clothes to their classrooms? Caspary said they might, and an angry McIntyre ended the meeting. Even when the cardinal’s men persuaded him to continue the conversation, he refused to accept the order’s plan for renewal. Instead, he berated their defiance and doubted their commitment to religious life. As of June 1968, he told them, they would no longer teach in the city’s Catholic schools. Over the next six months, the sisters and the cardinal presented formal cases to emissaries from the Vatican. Each side also sought support from Church colleagues and from the court of public opinion. Unfortunately, many newspapers played up the conflict as if the entire fight hinged on whether or not the sisters wore their traditional habits or street clothes. By spring, the message was clear: The Vatican would support the cardinal. According to official pronouncements, the women’s experimentation went too far. They had not, in other words, worked within the guidelines of the male hierarchy. Rather than give up their vision for religious renewal, however, 350 of the order’s 400 sisters began planning a new lay community outside the Church. By the start of 1970, many of the Immaculate Heart sisters had decided to renounce their vows and reorganize as a lay community. The new group, the Immaculate Heart Community, was open to laypeople as well as clergy, men as well as women. In the intervening years, most of the innovations that the sisters sought – including professionalizing standards, experimenting with community worship and giving sisters control of their daily activities – were adopted by Catholics across the country. The Immaculate Heart Sisters drew on their time and place to create a new vision of religious community. Their sources ranged from the reforms of the Second Vatican Council to the writings of California’s humanist psychologists. They also included women’s liberation, the anti-war movement and the countercultural wave that rolled outside their convent door. The California dream and its promise of new possibilities was central to the spiritual journey of the Immaculate Heart Sisters. It continues to inspire a new generations of seekers in and out of the Church. 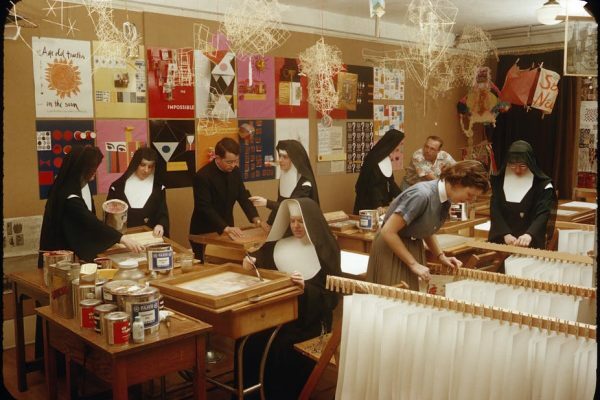 Top photo: Immaculate Heart College Art Department c. 1955. Photograph by Fred Swartz. Image courtesy of the Corita Art Center, Immaculate Heart Community, Los Angeles. 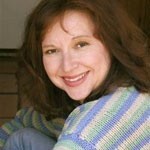 Diane Winston is a university fellow with the USC Center for Religion and Civic Culture.